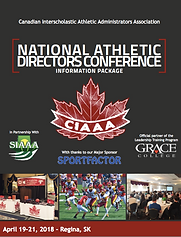 In partnership with SIAAA, and with thanks to our major conference sponsor Sportfactor, we are excited to promote our 3rd Annual National Athletic Directors Conference, running April 19-21, 2018 at the Hotel Saskatchewan in Regina, Saskatchewan. The CIAAA National Athletic Directors Conference offers a mixture of content, networking, and social opportunities combining for a dynamic, customizable, Athletic-Director centered professional development experience. The conference allows for up to 4 Leadership Training Program courses or 9 workshops, or anywhere in between, two keynote speakers – including Shawnee Harle – a vendor exhibition and an offsite social at the Escape Manor Regina. ​The cost of the conference includes all meals throughout the conference and covers the cost of one Leadership Training Program course. We are also offering member discounts for anyone taking three or four LTP courses. ​Click here to view the brochure in full detail, and click our ‘Event Registration’ link at the top of this page to register.